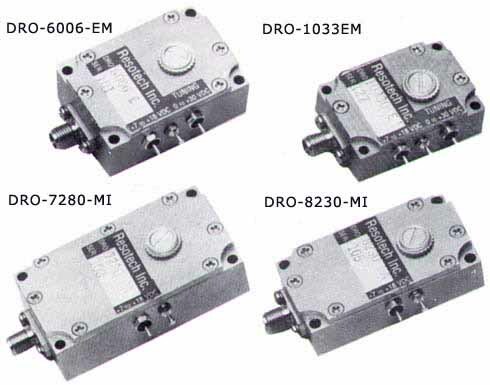 RESOTECH's fundamental frequency freerunning Dielectric Resonators (DROs) operate at frequencies from 2.8 to 14 GHz over -54 to +85°C. RESOTECH offers electrically tuned DROs with features that are unmatched in the industry. 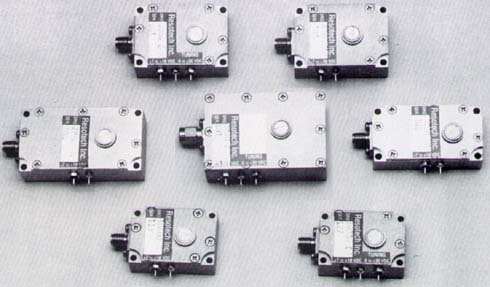 An electrical tuning range of up to 2% is available with excellent phase noise performance. The standard electrical tuning range option is 0.2-0.3%. A tuning linearity of better than 2:1 is available. All of RESOTECH's DROs feature a mechanical tuning range of 3-4% and 0.001% tuning resolution. Mechanical tuning stops are provided to prevent damage of the dielectric resonator. All GaAs FET DROs (4 to 13 GHz) incorporate a voltage regulator (with reverse polarity and over-voltage protection) which makes the DRO performance insensitive to power supple voltage level (+8 to + 18 VDC). RESOTECH welcomes any custom design request and can provide the necessary expertise, experience, and fast turnaround to meet your special requirements. Guaranteed Specifications over -30 to +70°C. Guaranteed Specification over -30 to +70°C. Electrical tuning ranges of up to 1.0 % at X-Band and up to 2.0% at S-Band are available. The standard tuning voltage range is 0 to +30V. For models with improved linearity (< 2:1) the tuning range is 0 to +22V. +20dBm min output power is optional. 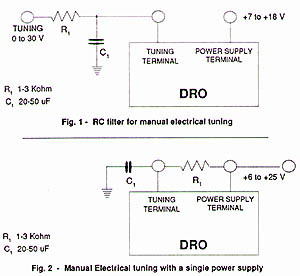 For manual electrical tuning applications of RESOTECH's DROs, an RC filter is recommended as shown in Fig. 1 to prevent phase noise degradation due to parasitic modulation by power supple ripples and/or low frequency interference. RESOTECH's DROs have negligible pushing due to an internal voltage regulator. This feature facilitates manual electrical tuning with a single power supply as shown in Fig. 2. At room temperature, the voltage tuning range is +6 to +25 V for a basic model and +6 to +18 V for a high stability model. In order to fully utilize RESOTECH's mechanical tuning, capability with good frequency resolution, the housing of the tuning element should be used for course tuning and the piston/rotor for fine adjustment. When adjusting the tuning element housing, the piston/rotor must be set near the top of the housing, but not lower than 0.5mm from the top. When securing the tuning element, do not over tighten.